The ibis Styles Bielsko-Biala hotel is located in the foothills of the Beskids, within 1.9 miles (3 km) from the main train and bus stations. 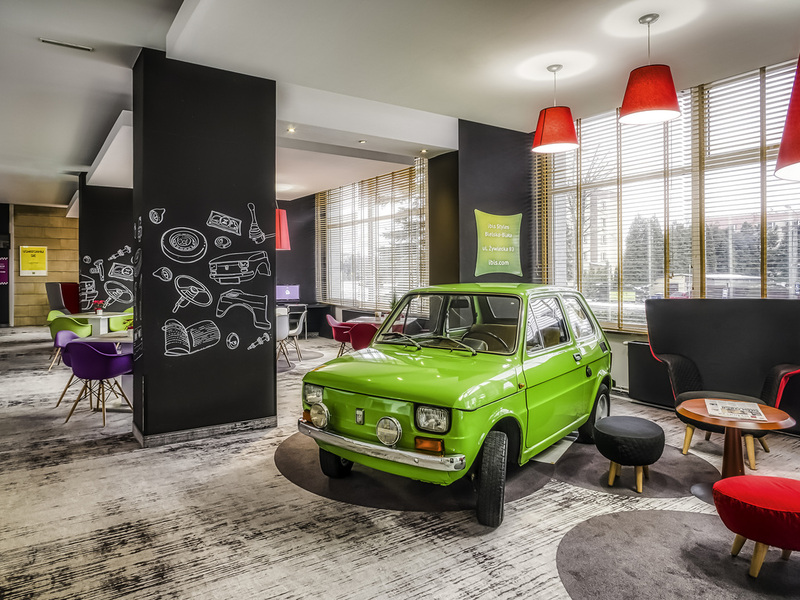 This 3-star hotel has an ideal location close to the Katowice-Zywiec road and the nearby Bielsko-Biala ring road provides easy access and is convenient for both business and leisure travel within the region. The hotel's bar is a perfect place to sum up a busy day with nice, relaxing accent. Enjoy a wide variety of drinks and snacks. The price can be very competitive compared to central hotels. Easy access to city centre with bus stop outside the hotel and also a taxi rank. Next door is a convenience store, and a 5 minute walk will get you to Gemini Park where you will find shops, chemists, supermarket, eateries (serving fast food,pizzas, sushi,healthy salads) and a cinema. Plenty of parking which is free. Next to the Park there is a wonderful play area for children. When you have a room opposite the lift it can be frustrating at night, especially if you wish to have a good night sleep. The staff were very nice and helpful, breakfasts were superb, but overall the building needs some updates, maybe a new coat of paint. Location is good only for those who know how to get there by bus or car. service on every level is perfect, thank you! 1. First impression from reception -perfect 2. Restaurant service and food - more than perfect 3. Room Service , special thanks I have no words to describe how amazing that team is , how clean rooms are . Perfect for its class. Friendly and helpful staff, good breakfast and clean rooms! The hotel provides basic service, it has been refurbished and updated but the beds are of very poor quality-similarly the towels. Comfortable and clean room, excellent breakfast. Great possibility to make tea or coffee in the lobby. Nice staff. Good location. Very good price if you make reservation in advance, children are free of charge. Highly recommended! I found the room to be very small. Breakfast choice simple but acceptable. I did not like that staff at breakfast did not wear uniforms, it looked unprofessional and confusing whether they are employees or not. There were no yogurts except for a small bowl of plain yogurt, oddly placed, not really clear what it was so I had to ask. Probably the biggest negative was the mattress, with a ditch in the middle - either a cheap type or overused. Very uncomfortable sleep there. The rooms remember the 70's when the hotel was erected. They are refurbished, especially the bathrooms so that the overall impression is OK. The beds are too soft, this is a problem common to most hotels in Poland. The staff was friendly. On the arrival day, the bar was open only until 8 p.m. We missed our drinks. All good and clean. The rooms are not so well appointed but it's acceptable for the price and location. This is not the Centre of town. This hotel started as a government establishment before tte change and the rooms and heating are all a bit antiquated. Not to worry as a small supermarket just down the road and bus to the Centre are handy. Good hotel Apple and hot drinks for free. I thoroughly appreciated the friendly and helpful staff at the restaurant, who made an extra effort to prepare a warm meal for my children shortly before the closing time of the restaurant. The reception desk staff always smiled and was ready to assist. The rooms were warm, quite clean and well supplied, but could use a little refurbishing.